After decades of broken promises by a string of Italian governments, it looks as though the Axum obelisk is finally going home to Ethiopia. One of the country's most prized monuments was taken in 1937 when Italian soldiers marched into Axum in northern Ethiopia on the orders of Italy's fascist leader Benito Mussolini. 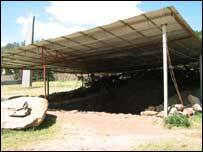 The 100-tonne obelisk, which marked the beginning of Ethiopian civilisation nearly 2,000 years ago, was hauled off in several huge pieces and shipped to Rome. Mussolini was immensely proud of his trophy and saw it as a magnificent symbol of the new Roman Empire. But the people of Axum were devastated by its loss and ever since then, Ethiopians everywhere have prayed for its return. Despite continuing protests from some mainly right wing politicians in Italy, Silvio Berlusconi's government has carefully dismantled the obelisk and sent it in pieces to Rome military airport. It is now wrapped and waiting for a plane big enough to cope with its enormous weight. When that is found it will be winging its way back to Axum. "We were very sad. We were crying as we looked at what the soldiers were doing. "As an old man now I am waiting to see it being brought back again. It makes me very happy. 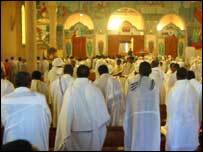 The people of Axum are waiting to celebrate this moment," he said. Massive parties are planned and the date it comes back will be made into an annual national holiday. "Everybody, the whole world will celebrate. All civilised people, all history loving, freedom loving people, all kinds of people will celebrate with us," he said. One of the reasons given by successive Italian Governments for not returning the obelisk earlier is that it would not be looked after properly in Ethiopia. This, despite the fact that the obelisk has been badly damaged by pollution in Rome and was even hit by lightening there a few years ago. Critics here also point out that both of the two remaining obelisks in Axum are in remarkably good condition and have not had to endure the sort of air pollution found in the Italian capital. 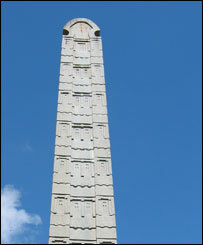 Arguments over the obelisk have soured relations between Rome and Addis Ababa since the end of World War II. In recent years Ethiopia's Foreign Minister Seyoum Mesfin has led his government's efforts to persuade Italy to give the monument back. "The significance of the return of the obelisk to Ethiopia is of paramount importance. It's our identity, it is part of us. It is part of our own history. It's a very emotional matter here." Now, it seems, attention in Ethiopia will shift from Italy to the UK. In 1868 British troops looted Emperor Tewodros's mountain fortress of Maqdala seizing hordes of valuable church property. Their haul included golden crowns and chalices, tabots, altar slabs, beautiful processional crosses and dozens of fine manuscripts. These are still kept at a variety of locations in the UK from the Victoria and Albert Museum to Windsor Castle. Professor Richard Pankhurst, son of the famous suffragette Sylvia, has become an ardent campaigner for all these items to be returned. Speaking at his home in Addis Ababa, the co-founder of the Return Our Obelisk Committee, says it is time Britain took a leaf out of Italy's book and prepared to send back the treasures it stole in the name of the empire so long ago. "This collection of loot from Maqdala was, I would argue, entirely unjustified and without justification in international law. This was an act of sacrilege. These items should be returned," he said.